Is the 'hybrid self-checkout' about to transform retail? French international retail group Auchan have adopted the first hybrid checkout deployed in a hypermarket. Provided by Fujitsu, the hybrid model is designed to rapidly switch between attended-service mode and traditional cashier-operated approach. At peak times the hybrid solution allows employees to support the scanning phase to reduce customer waiting time. We caught up with Fujitsu's Retail Industry Consultant Sarah Kellett to tell us more. TechRadar Pro: Fujitsu has provided Auchan the first hybrid checkout deployed in a hypermarket; what is the benefit of a hybrid approach? Sarah Kellett: A hybrid approach allows store operators to quickly switch between attended-service mode and a traditional cashier-operated mode. This can greatly reduce customer wait times during peak shopping periods (be it specific times of the day, or seasonal Christmas rush). As such staff can be better allocated to serve the customer, cutting down queues before they even begin to form. Stress for staff can also be greatly reduced as the checkouts are cash-recycling, meaning staff do not need to handle cash and run a manual balance when opening and closing tills. TRP: What impact will this have on the retailer and the customer? SK: The retailer will be able to be more agile, and respond to customer demands quickly, which helps drive efficiency. The most successful retailers will always experiment with new technologies to deliver the best customer experience whilst making it easier for their staff to do their jobs effectively. The positive impact for stores is representative of the ability to turn new technology into profitability through the retail value chain. The best retailers never forget what the customer wants, and hybrid checkouts signify a customer centric approach – putting them firmly in the driving seat of their shopping experience. 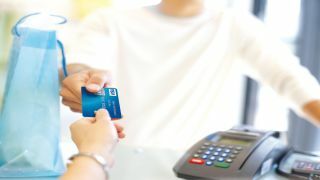 Convenience is paramount to the time-poor shopper, and the checkout queue is often incredibly stressful, but this can now be a thing of the past. This flexible, and scalable, approach is a true win-win for the retailer and customer alike. TRP: What would be the top three benefits of deploying a hybrid checkout for the retailer? SK: Reliability, increased staff productivity, and flexibility are the top three benefits for retailers by successfully implementing new in-store technology. Integrated support tools can maximize reliability and speed of service support by fixing problems locally thereby eliminating the need for time-consuming and costly outbound support. This enables employees to focus solely on the customer, being more productive and more focussed on their needs. As such, retailers can align staff productivity directly to customer activity. TRP: How have customers taken to this approach? SK: The results have been extremely positive. Since the rise of online and digital retail, customers have become accustomed to expect an engaging, and more personalised, experience when they visit a store. Growing customer expectations and increasing demands have left retailers rethinking the ways in which customers engage with the retail brand. A hybrid approach ensures the customer is never inconvenienced, as well as guaranteeing there are more staff available to help and support them in store; a key differentiator to the online retail experience. TRP: Can you talk us through how U-Scan Genesis solution works? SK: The U-Scan Genesis Retail Solution improves customer experience personalising cross-channel shopping. The popularity of smartphones apps is incredibly important when considering the shopper's in-store engagement. The forthcoming myU-Scan Mobile Application allows individual customisation at any U-Scan station. Available for Android and iOS devices, myU-Scan will deliver a unique Quick Response (QR) Barcode to customers' mobile devices. Therefore personalised identification data and pre-selected shopping and payment preferences, as well as lists of favourite items, are easily to hand at the checkout and available for reuse or editing. By enabling a better, more tailored, customer experience, retailers can create a synergy with their customers. Self-checkout is an important part of the Point of Service mix, particularly for mass merchandisers. The U-Scan Genesis solution enables retail establishments to stay ahead of the competition and maximise their return on investment, while exceeding customer expectations. TRP: Do you feel this 'end-to-end' approach is the future of retail? SK: Customer demand dictates the wind of change; and customers are increasingly asking for more personalised, bespoke shopping services. It's imperative that retailers don't overlook this fact and continue to innovate in the offerings and services they provide. Convenience and personalisation are not only driving the desire for an automated buying experience, but are also driving the rise of omni-channel retail. Technology is therefore only going to become more instrumental in the shopping process for consumers. TRP: Where do you see this solution going next? SK: Currently there has been a huge success in hypermarkets, but the solution is of key benefit to all mass-merchandisers; from a large retailer down to your local convenience store. The advantages for the customer and retailer alike are apparent; meaning the only road block is the readiness to adopt and implement it. TRP: How automated do you think our retail environment will be? SK: It is unlikely clicks will ever truly replace bricks, as there's a clear space and need for physical retail. With that in mind you cannot ignore the wealth of consumer interest in a more automated shopping experience. Customers demand personalisation and convenience, and an end to end approach that offers the best of both virtual and physical methods is a good indication of what our future retail environment will look like.